The bundle offer is over. And it manages to raise approximately $6.73 million. for the charities that protect justice, human and civil rights. And yes, 100% of these earnings are shared among the three charities: The ACLU, Medecins Sans Frontiers/Doctors Without Borders, and the International Rescue Committee. First a bit of bad news: Subnautica has sold out, and is no longer available as part of the bundle. You will get the new stuff even if you purchased the bundle before they were added. 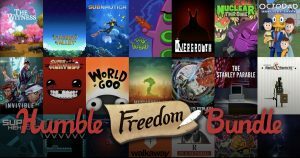 Humble Bundle has launched a one-week-only “Freedom Bundle” containing around $600 worth of games, ebooks, and audio books. The bundle has a starting cost of $30, and 100 percent of it will go to three charities: The ACLU, Medecins Sans Frontiers/Doctors Without Borders, and the International Rescue Committee. Humble Bundle matching the first $300,000 raised. The Humble Freedom Bundle is live now and will run until February 20th.